What is the most boring sport? January 10, 2018, 11:46 a.m.
For everyone who has ever been crestfallen to find their TV monopolised by sports fans for hours at a time, their party conversation hijacked by sports chat, or been dragged along to a sporting event by a partner, YouGov has some solace for you: you are not alone. The fact is, Brits tend to find sports boring. 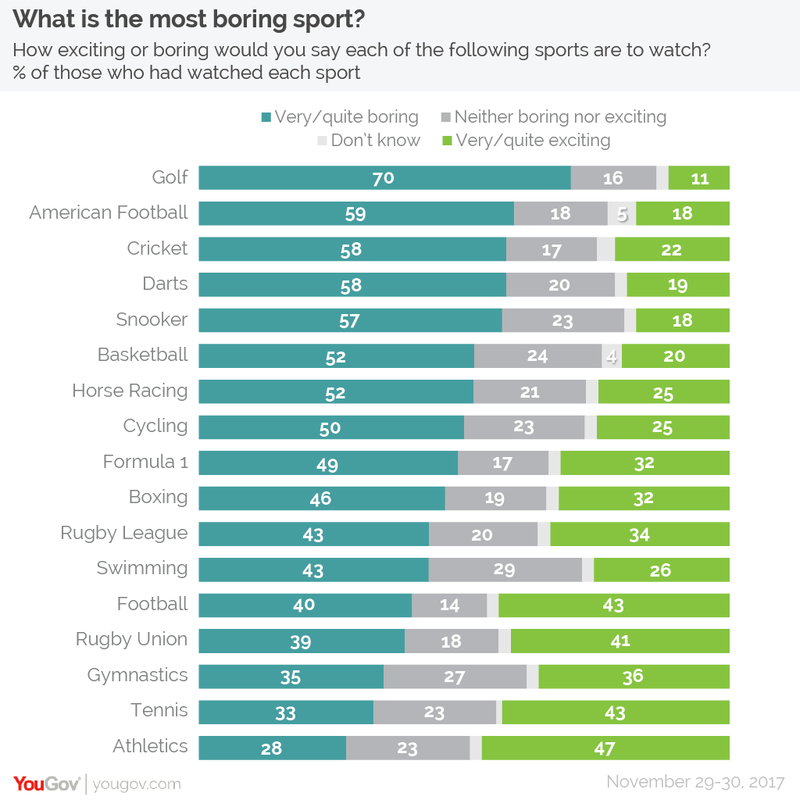 In a bid to find out which are the most exciting and boring sports to watch, YouGov Omnibus asked the British public about 17 sports and found that for 13 of them people who had watched them were more likely to find them boring than exciting. But which is the most sport most likely to send Brits to sleep? And which the most likely to have them on their feet, shouting at the TV? The adage that golf is a way of ruining a good walk has been misattributed to both Mark Twain and Winston Churchill over the years. The sentiment remains strong with the British public however, with YouGov now able to crown golf as Britain’s most boring sport. Overall, 70% of Brits who have ever watched the sport say that golf is boring (including 52% who say it is very boring). Golf holds a long lead over the next most boring sports. American Football is the second most snooze-worthy sport, being branded boring by 59% of people who have ever watched it, followed closely by cricket (58%), darts (also 58%) and snooker (57%). At the other end of the league table, the British public find athletics to be the most exciting sport, with 47% of those who have watched it finding it thrilling. 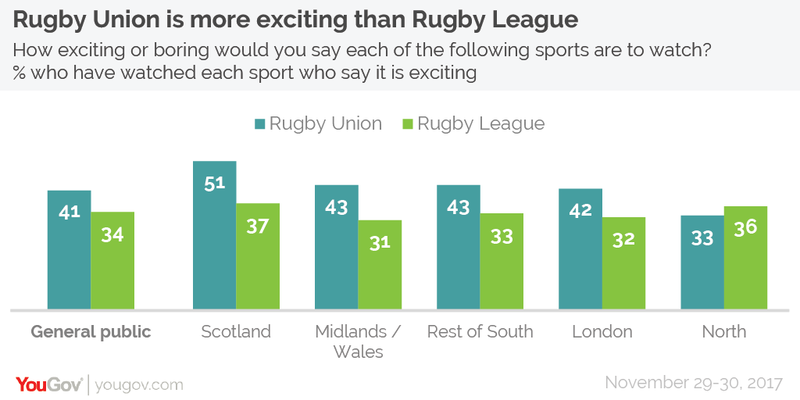 Athletics is followed in joint-second place by football and tennis, which 43% find exciting (and with football being the sport the highest number of people finding “very exciting”, at 20%). While it may be seen as the second most exciting sport, football is also Britain’s most divisive support. It is the sport that viewers are least likely to sit on the fence about (84% find it boring/exciting, only 16% find it neither or don’t know), and opinions are near evenly matched – the 43% who find it exciting are countered by 40% who find it boring. The survey pitted rival rugby variants League and Union against one another, with Union emerging as the more exciting of the two. Just over a third (35%) of those who have watched Union find the sport exciting compared to 28% for those who have watched League. Unsurprisingly there is a geographical difference in opinion, with Northerners being more likely to slate Union (40% say it is boring, compared to 22-34% among other Brits). Northerners aren’t, however, more likely to say League is more exciting than Union, being effectively tied at 30% and 29% respectively. Nor is the 30% of Northerners who find League exciting particularly high compared to the other regions and nations of Britain, at 24-29%.